I picked up the first two issues of Terry Moore's "Motor Girl" recently. 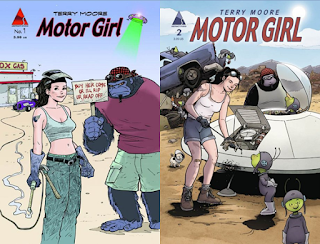 Back in September I wrote about Abstract Studio, Moore's independent comic publishing company, so when I saw the issues, I wanted to see what Terry's all about. One thing that caught my attention was the awesome nature of the paper quality: it looks and feels like Xerox paper. The covers are shiny and feel like pamphlet material. It seems like stuff I could get done at Kinko's, but of course I'm not an old school classic comic creator. Or the publisher of such. Now, I enjoyed the two issues. Samantha, the titular Motor Girl, is a former soldier with some serious PTSD-(we're guessing)induced hallucinations. She runs a junkyard in BFE Nevada and someone is trying to buy it. This someone sends thugs to greet the owner, and elder lady, and Samantha to try and persuade them to sell. Why does anyone want the spot so bad? Are the aliens who stopped by---on two separate occasions--- real or one of Samantha's hallucinations? The art is charming and expressive while light on certain details, which may or may not be indicative of Terry Moore; I've yet to read "Strangers in Paradise", "Echo", or "Rachel Rising." I enjoyed it and felt it was off beat and had real feeling embedded in the black ink drawings. Evolution of Comix: Vigneault's "Titan"